A full-size ( = ½λ) dipole antenna for the 20 mtr band spans about 10 meters (33 ft). One of the 20 mtr antennas that I built is a half-size 2-element "yagi" beam antenna, based on a design by Gary Hanson (KJ5VW), ref. 1. The "driven element" of such antennas is a dipole. 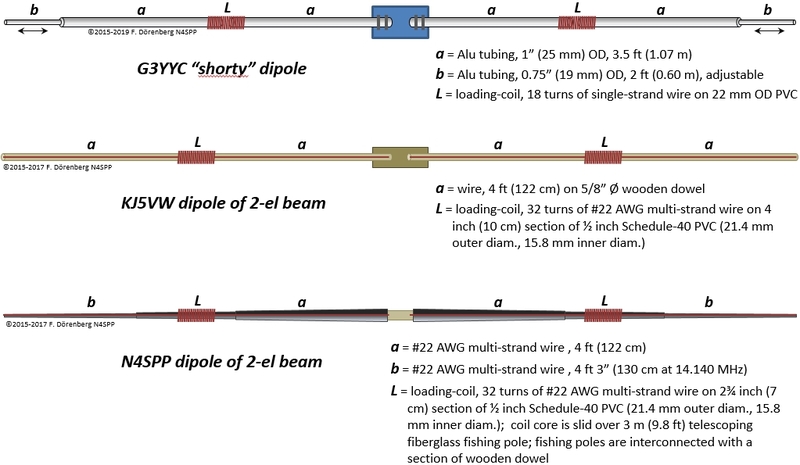 The dipole in the KJ5VW design is derived from a design by Frank Lee (G3YCC (SK), ref. 2. The first step in making the 2-element antenna, is building the dipole. So: why not try that dipole just by itself? 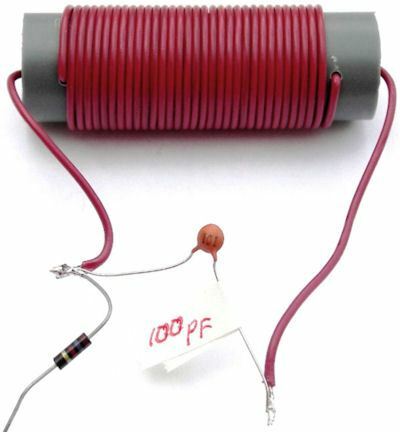 The G3YCC "shorty" dipole is made of aluminium tubing, whereas the KJ5VW model is a wire-dipole. Both are "half size" dipoles. Scaling-down an full-size antenna by more than 50% causes significant performance reductions. However, I have actually built very small loaded dipoles for 80/40/20 that are scaled-down by 95% (!) and work interestingly well for their size (but, sorry, no miracles...). To make a shortened dipole resonant, some form of loading is required. One standard solution is "inductive loading": adding a loading coil to each "leg" of the dipole. The loading coils is placed somewhere between the feedpoint and the tip of each "leg". The current-distribution along the main elements is such that the current is highest at the feedpoint. Placing a loading coil here, requires the smallest inductance. The current-distribution tapers off, from maximum at the feedpoint to zero at the tip of the radiator element. So, as the loading coil is placed farther away from the feedpoint, a larger inductance is required. At the tip of the main element, the current is zero. This would require an infinitely large inductance. See the diagram below. The placement of the coils does affect the shape of the current distribution, but does not change the fact that it is maximum at the feedpoint and zero at the tip. Center-loading (also called "base loading" when talking about vertical monopole antennas) requires the smallest inductance. It is often easier to construct than off-center loading. So why not always use center-loading? This is primarily driven by coil losses, hence, efficiency of the antenna. The coil losses basically depend on the current, coil dimensions, material, construction, and core. Depending on the diameter of the radiator element (tubing, wire) and installation height, the most efficient placement of the loading coil is somewhere between 30 and 60% away from the feedpoint (ref. 3, 4). I.e., around the mid-point. The G3YCC and KJ5VW dipoles are "mid-element loaded". Note that the efficiency-vs-placement curves are fairly flat over a relatively large range around the mid-point. Note that this tends to shift towards the tip of the monopole when "capacitive hat" loading is added at the tips. Short, loaded antennas typically have a (much) smaller bandwidth than a similar full-size antenna. The higher the "Q" of the loading coils, the narrower the bandwidth. But when "Q" is lowered, antenna gain is decreased. Ref. 4. I decided to build a light-weight, portable version of the KJ5VW antenna. Each leg of my dipole consists of a 10 ft ( = 3 m) lightweight telescopic fiberglass fishing pole. Got them at the end-of-summer sale at a local supermarket. 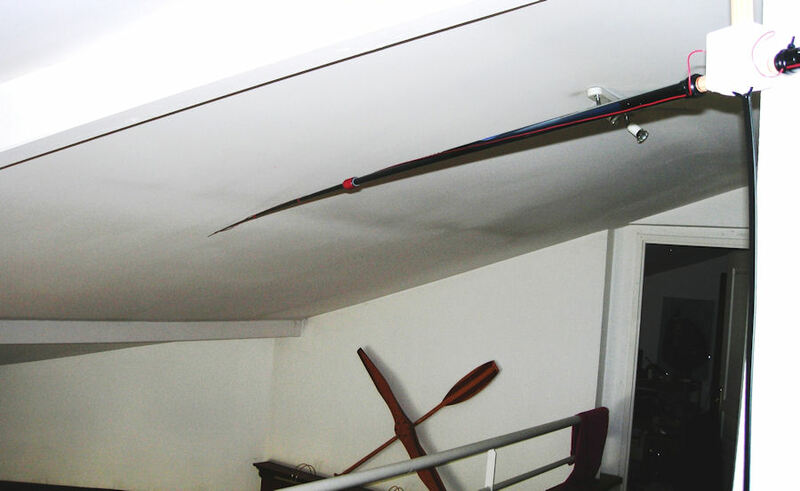 The poles have 3 collapsible sections of 4 ft. Each pole only weighs 4½ ounces (130 grams)! Note: some such poles are made of carbon fiber or with graphite. I do not know if they are conductive for RF and cause undesirable loading (or losses) of the dipole. Each coil core consists of a 7 cm (2¾ inch) long section of 1/2 inch Schedule-40 PVC pipe from the building supply store (21.4 mm outer diameter; 15.8 mm inner diam.). This is not the lightweight light gray pipe, but heavy duty, thick-walled "rigid non-metallic conduit - above ground underground" pipe. However, this is not critical for this application! 2.2 m (7+ ft) of wire for the coil itself. 1.5 m (5 feet) sticking out beyond each coil-end (i.e., 2x 1.5 m). This includes margin for "tuning-and-pruning" the antenna to the desired center frequency. note that the wire is not cut - I simply pulled 2.2 + 1.5 m through the starter hole in the coil core, wound the coil, and pulled the remaining 1.5 m wire through the exit hole of the coil core. With this type of wire, the required 32 turns produce a coil that is just over 5 cm long (2"). Drill feed-through holes with a distance of 5.1 cm (2") between the holes (not center-to-center) to nicely fit the coil. See photo below. I used a 5/64" (2 mm) drill bit. The wire is fixed in place with small dabs of waterproof glue on the outside of the first and the last turn. I have used both the universal 2-component epoxy glues "UHU Endfest 300" and "Eccobond 286 Blue" (which even holds up in the dishwasher and the microwave oven). Gorilla Glue® also works. You cannot wind coils like I, and I cannot wind coils like you. Coil-winding data is a constant that varies from person to person. 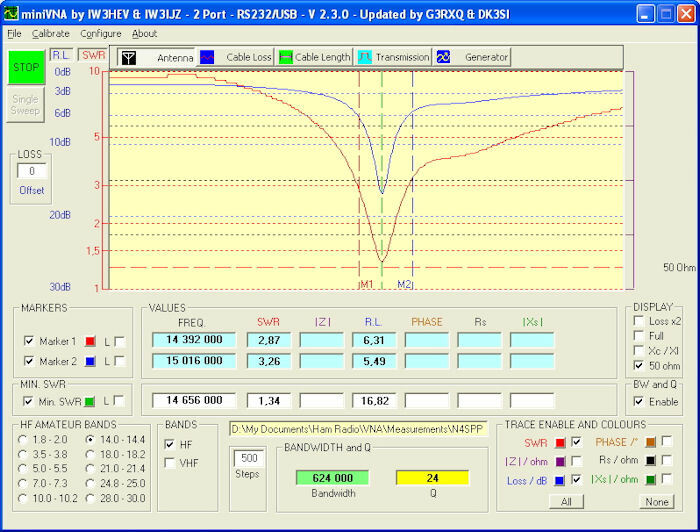 Loaded-dipole calculators (e.g., ref. 5A/B/C/D) suggest that - for the given dimensions of the antenna - the loading coils should have an inductance of about 8.5 μH. Coil calculators (e.g., ref. 6A/B/C) suggest that the KJ5VW coils have an inductance of about 9 μH. That's in the ballpark - and, as over 30 years of professional engineering experience has taught me: anything within ±20% is within engineering accuracy, hi! Out of curiosity, I checked the actual inductance with my miniVNA antenna analyzer (series & parallel resonance) and with my dip-meter (ref. 7), and found 8.9 μH. Of course, accuracy of the measurement is affected by the tolerance of the capacitor value. When new, ceramic disk caps typically have +80/-20% tolerance, milar polyester typ. ±5 or ±20%, tantalum typ. ±10 or ±20%, metalized polypropylene typ. ±5, ±10, or ±20%, electrolytic typ. ±20%, etc. Note that cheap LC-meters typically measure inductance and capacitance well below 100 kHz, and the indicated values are not valid at RF frequencies. My coils are cylindrical and wound on a PVC core. The same inductance can be obtained with small toroidal iron powder cores: e.g., about 30 turns on a T-130-2 core (1.3" diameter), and about 45 turns on a T-50-2 core (0.5" diameter). Ref. 8. You may have to stack 2 or 3 such small cores to get 4x or 9x power handling. Tuning-and-pruning. The coils are slid over the fishing poles, until they are at the mid-point. The wire on the feedpoint side of the coils is attached at the feedpoint, with about 10 cm (4") excess, for connecting to the feed line. The wire on the opposite side of the coil is pulled taught and attached near the tip of the fishing pole. My desired resonance frequency is about 14150 kHz, so as to cover both 14230 kHz (SSTV) and digi-modes around 14070 kHz. With the help of a dip-meter or antenna analyzer, the resonance frequency is checked. For the starting length of wire beyond the Ioading coils, the initial resonance frequency should always be low. The resonance frequency is now increased bit-by-bit to the desired value: trim the tip-wires 1-2 cm (½-1 inch) and re-check the resonance frequency. Resonance frequency went up by about 50 kHz per centimeter trimmed (≈125 kHz per inch). The cut-and-check operation is repeated until the desired resonance frequency is obtained. Keep in mind that it is much easier to cut "off" a small piece of wire, than to cut it "on"! So, keep track of how much the resonance frequency increases each time your trim a piece, and stop pruning before you overshoot the target frequency too much. Note that the final wire length beyond the coil not only depends on the desired resonance frequency, the coil, and the wire length between the feedpoint and the coil: it also depends on the wire diameter and the wire insulation (velocity factor), installation height above ground, soil/ground conditions, objects below and near the antenna, etc. 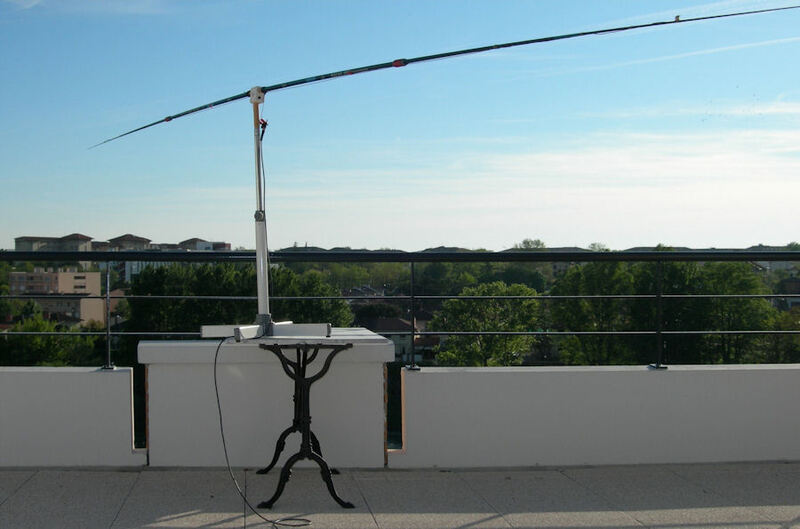 In April of 2008, I installed the dipole on the terrace of my new QTH, still in the south of France. Had a brief mid-afternoon 50 watt SSTV-QSO with Federico (ISØWAV on Sardinia, about 800 km / 500 mi). He gave the mini-dipole a 2-S point advantage over my "Cobra"-dipole. The mini-dipole was parallel to the Cobra-dipole, with the wires approximately pointing toward the station (which would be the null-direction). I also had solid transatlantic SSTV-QSOs that evening, with N1ABA (New Hampshire/USA) and N2TA (New York). Not bad for the size of the antenna! Ref. 5C: "Loaded dipole calculator (.exe)" by Al Legary (VE3SQB). Note: the GUI of this calculator shows inductance as "mH" instead of "μH"! Ref. 6B: "K1QW Inductor Calculators"
Ref. 6C: "ON4AA Single-layer Helical Round Wire Coil Inductor Calculator"
Ref. 8: "Turns-length calculator for ferrite and iron powder core toroids"